All-Inclusive Software, CICTotal Manager™, Empowers Rental Properties Across the U.S. The property management software is strengthened with full accounting, tenant management, tenant screening, and marketing tools. With no setup or onboarding costs, and no long-term contract, CICTotal Manager™ is a powerful platform for landlords and property management companies. Contemporary Information Corporation™ (CIC™), the nation’s leading provider of background screening, has developed their property management software, CICTotal Manager™, to include a suite of powerful features. Developed by Rentec Direct, the robust software platform empowers property managers and landlords within the rental housing industry with distinct advantages that help manage their portfolios and maintain excellent bottom lines. Strengthened with tools like a full accounting platform, tenant management suite, and CIC™’s best-in-class tenant screening, this new-and-improved property management software is rich in features. This includes financial and operational reporting, tenant and owner portals with a free customizable website, e-payments and bank account sync. This affordable and all-inclusive software also comes with a robust set of marketing and lead tracking tools, like their automated listing syndication, in order to strengthen each property’s online reputation. With no setup or onboarding costs, and no long-term contract, CICTotal Manager™ is a powerful platform for landlords and property management companies. Pricing is based on the number of units in a subscribers portfolio, with tenant screening provided by CIC at discounted rates. 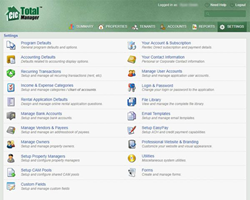 The software company also provides unlimited user accounts, tenant, and owner portals.